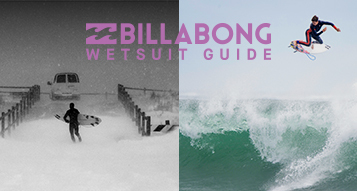 Palm Springs – A place Billabong has never ventured, quite simply because it is in the desert and we tend to chase the waves on our endless adventures. 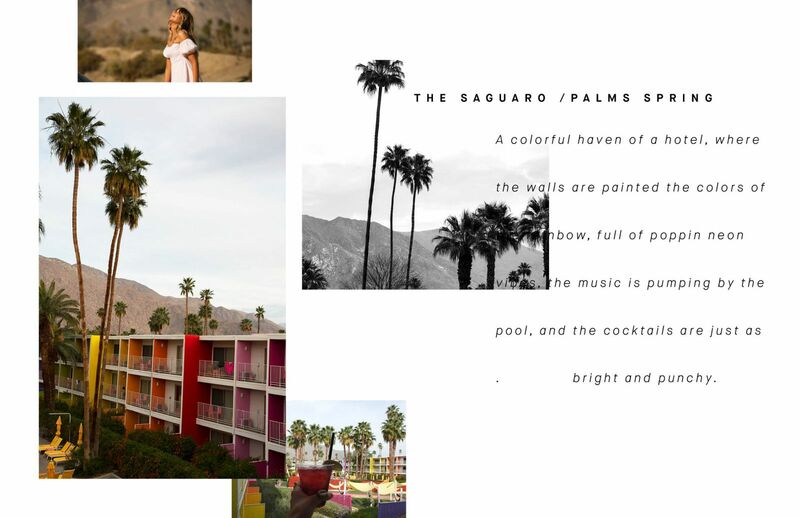 We seriously did not know paradise could exist away from the sea, but Palm Springs proved us otherwise. 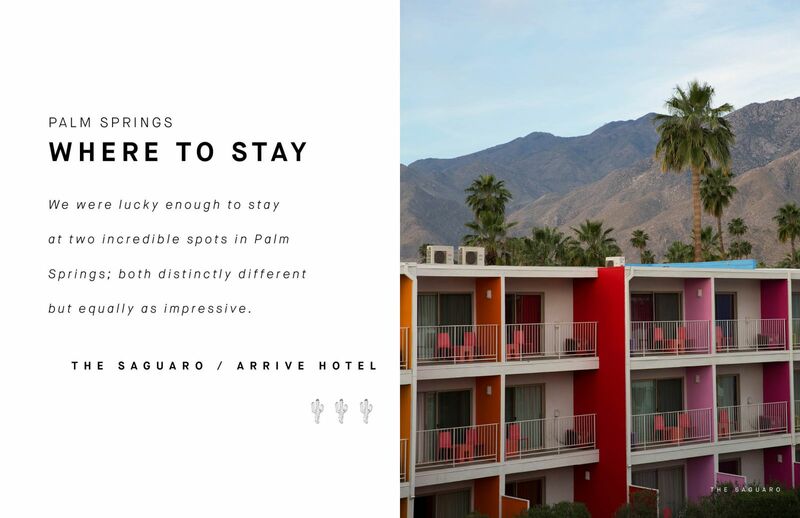 Here is our guide for Palm Springs. It’s a city, but it doesn’t feel like one. There is 350 days of sun a year. There is space, room to move, and warm air to breathe. 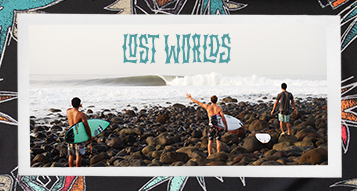 The streets are wide and the views are vast. 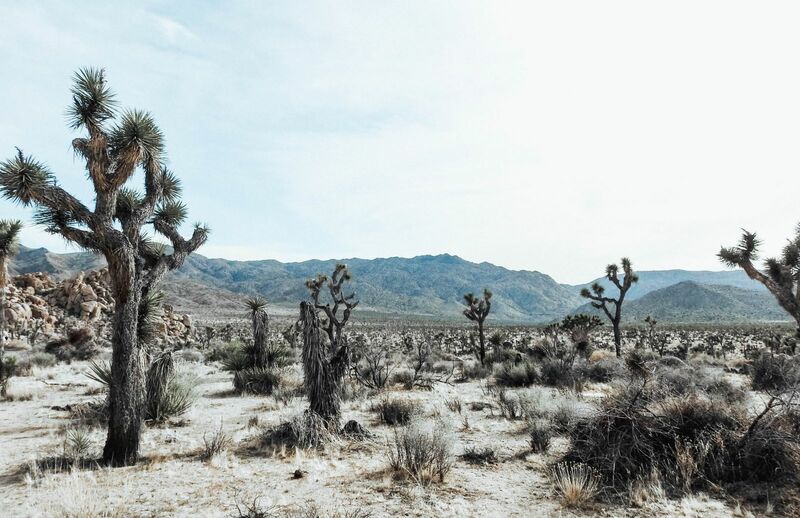 There is something magical about it, one minute you feel as if you are in an old Hollywood movie, and the next you feel as if you are on Mars due to the eerie, rocky expanse of Joshua Tree. We spent a few days exploring the Southern Californian oasis with Elle Ferguson as our muse and inspiration behind the collection, the talented Jennifer Stenglein behind the lens and our favourite friend on hair and makeup; Ashlea Penfold. 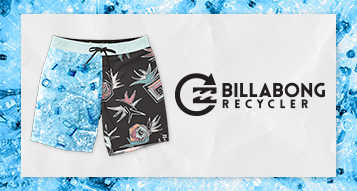 Click here to check out the Billabong x Elle collection Read on to find out our tips to make your vacay to Palm Springs, one to remember, forever. 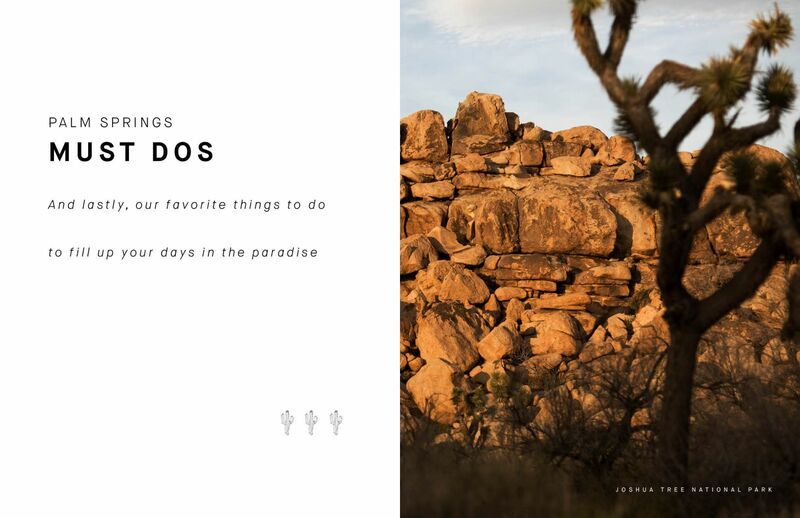 The Saguaro: Spend your days lazing by the pool, explore on one of the desert cruiser bikes, get involved in the daily yoga or the 24 hour gym to work off the copious amounts of chips and guac from their very own Mexican restaurant; El Jefe. Also, fun fact – this hotel is the most instagrammed in the world! No filter needed. 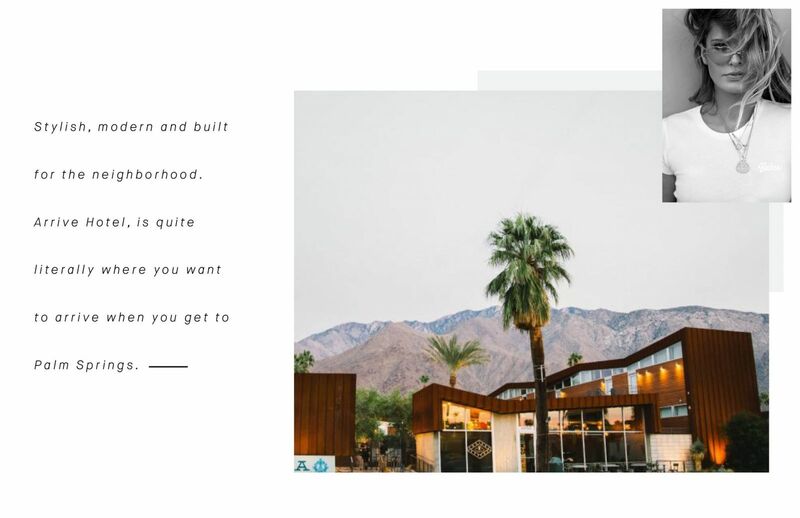 Arrive Hotel: It’s all in the carefully curated details here, like the elegant courtyard pool with cabanas featuring firepits, bocce court and ping pong tables, a restaurant on-site that serves scrumptious Southern Californian cuisine, and a coffee and ice-cream shop. Simple yet sophisticated, with everything you need within arms reach, you don’t actually need to leave the premises. SUNdays here are the best, live music and vinyl. 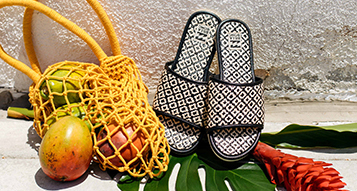 Think a dip and a drink for ultimate rancho relaxo. Ernest Coffee: Often quoted as the best coffee in Palm Springs, they pump out Stumptown brew, have freshly baked treats (including gluten-free) and offer all the different dairy alternatives for that morning cup of joe. This place has a long standing history and you may like it so much you might pop back for happy hour and to catch some rays on their south facing patio. 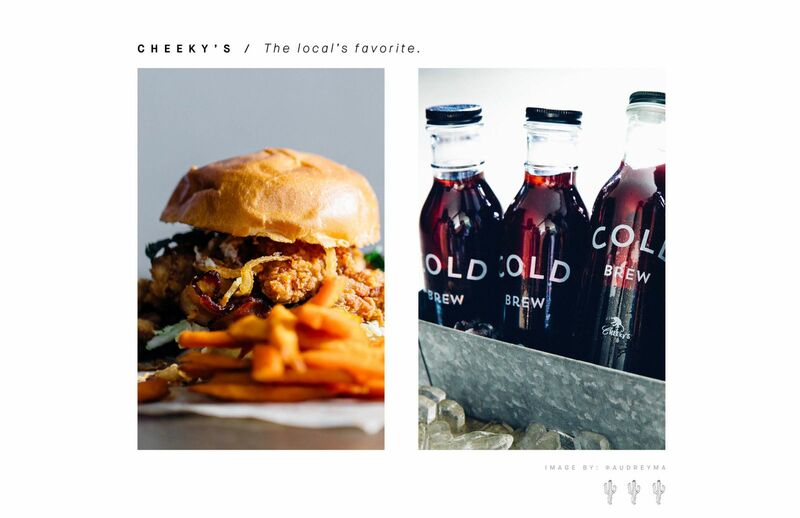 Cheeky’s: Breakfast is served all day at Cheeky’s but prepare to wait – this place is a local favorite. If you salivate for sweet, think buttermilk pancakes, nectarine waffles and brioche French toast topped with fresh fruits, or if you always select savory, then the quesadilla or crispy potatoe cake would be your best bet! 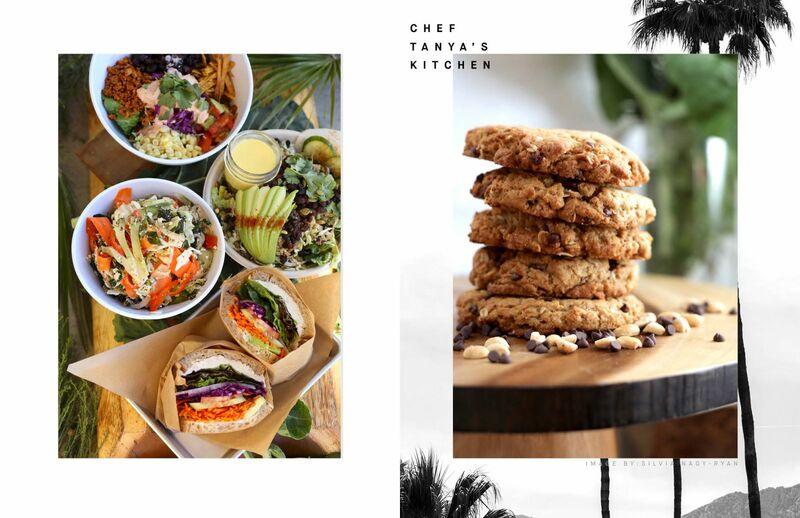 Chef Tanya’s Kitchen: This place is a must do if you are all about food as nourishment. Tanya’s philosophy is ‘Eat plants. Look good in your pants.’ Cuban vegan food at it’s finest, specialising in salads and sandwiches. If you go for the Coachella Forever you will experience a festival in your mouth. You heard it here first. 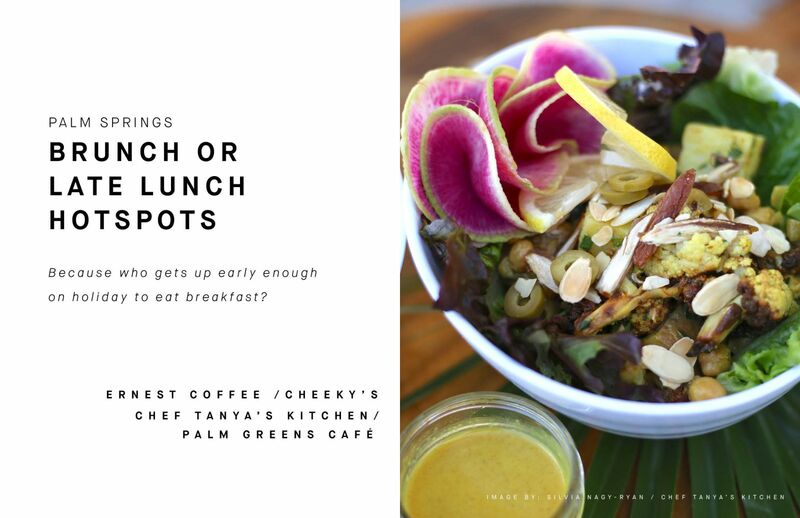 Palm Greens Café: Venture here if you are after a healthy smoothie, or simply scrambled eggs on toast. The menu is vast, the staff will adapt or change anything to your hearts content with options of gluten free, vegetarian, vegan and organic. Seriously an easy feed and something for everyone. The Pantry: A restaurant at the ‘Holiday House’ boutique hotel that has ‘Fried Chicken Fridays’ – a family style supper for a number of guests. The menu changes slightly every week but expect to be Very. Well. Fed. Reservations are definitely required if you aren’t staying at the hotel. 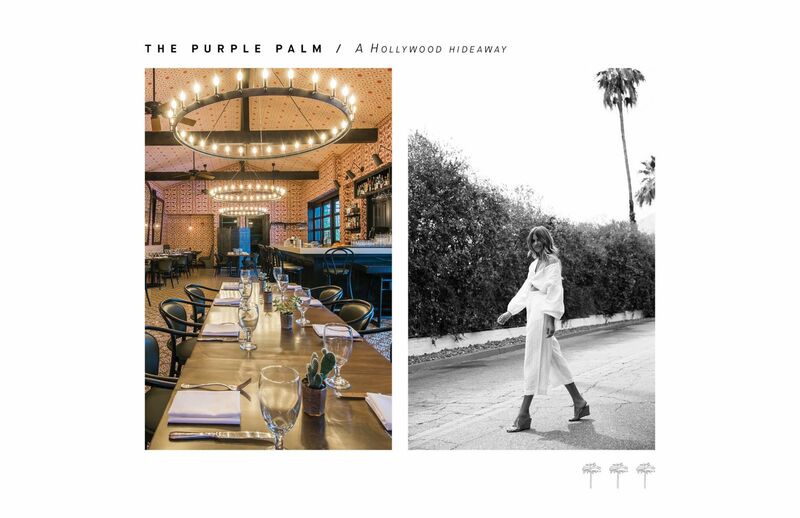 The Purple Palm: Californian style cuisine served from the Colony Palms Hotel, that really hits the spot. The chef here is all about inventive, seasonally changing menu’s focused on fresh and organic produce. There is sustainable seafood like seared sea scallops, coconul milk ceviche and pan roasted salmon; all dishes that are hard to find in the desert. Check out this Hollywood hideaway for happy hour and you will not be disappointed. Draughtsman: A hop skip and a jump down from Arrive Hotel, you will find a pub that serves modern food rather than standard pub grub, a rotating selection of craft beers, hand-crafted cocktails and all the sports playing on the big screen TVs. 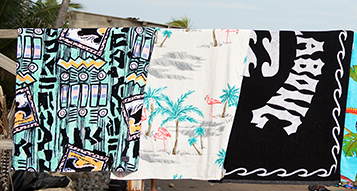 With such a laid back vibe it should be your first port of call to set the scene for your holiday. Birba: We spent our last night at this bustling bar and had pizza that really hit the spot after a long days shooting. The outdoor patio with fairy lights, live music under the canopy of the tree and the sleek open-air bar was the icing on the cake and was the perfect end to our Palm Springs stay. 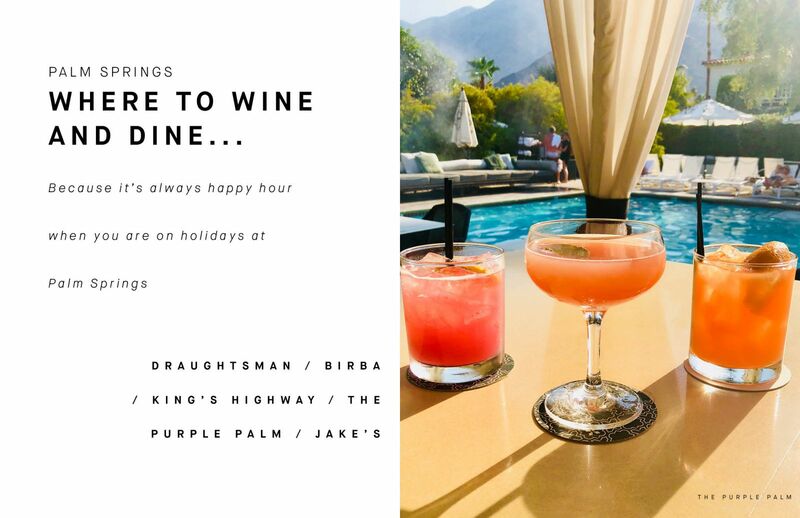 King’s Highway: Designed to resemble a roadside diner, minus the grease, the King’s Highway restaurant at the Ace Hotel celebrates the bohemian spirit of the wild West and is a Palm Springs staple. Scrumptious burgers, tasty taco’s and simple yet sophisticated salads make up the menu. No surprise, the garlic fries are a must have – calories don’t count on holiday right! Jake’s:This spot is a hip, casual American bistro in the Uptown District of Palm Springs. The dishes are simple and elegant, original and heartwarming and to sum it up; good ol soul food. You can choose to dine alfresco under the dazzling desert sky, or enjoy the indoor intimate dining room. This place has won many awards, but is modest about it. Your turn to be the judge. 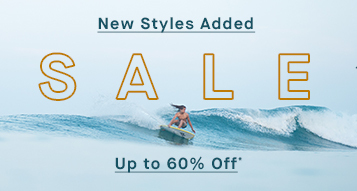 Hang by the Pool at the Ace Hotel:For a day that you don’t fancy doing too much and need to cool off from the sweltering desert sun then pop on over to Ace Hotel’s pool to while away the day. If you go on the weekends expect great music, beautiful people, DJS + delicious drinks. It will be one of the coolest pool parties you’ve ever been to! 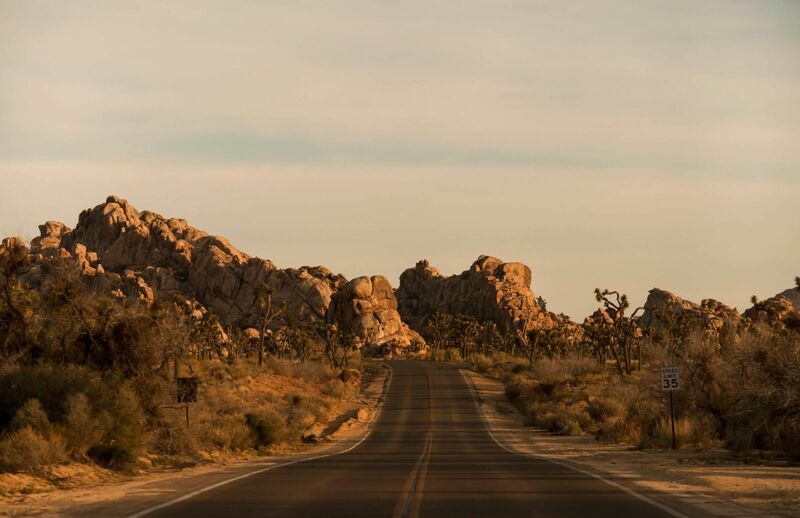 Visit Joshua Tree National Park: About an hours drive away from Palm Springs is a whole other world; Joshua Tree is a spectacular terrain where the Mojave and Lower Colorado deserts join, resulting in rugged rock formations and stark desert landscapes. Make sure to venture there for sunrise or sunset, when the colours change dramatically. Definitely do your research if you want to hike and remember to take supplies. 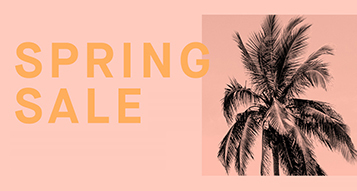 Venture on a Door Tour: Palm Springs is a haven for mid-century architecture and home to some of the most beautiful homes on the planet. 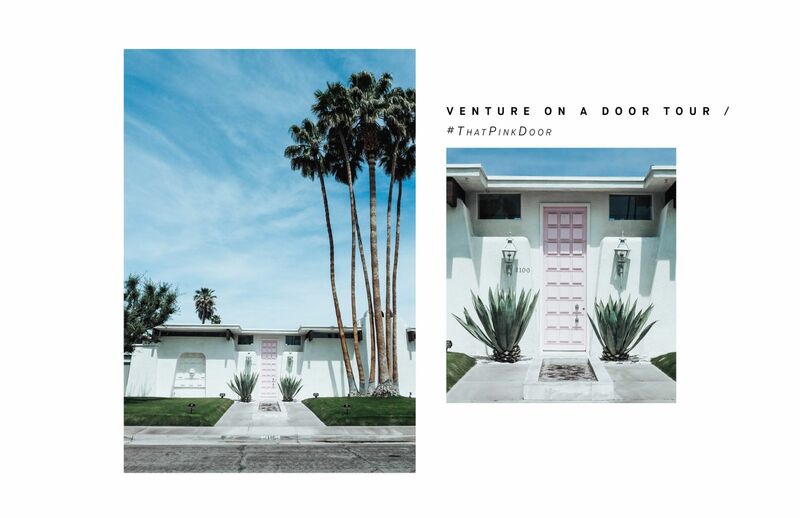 A lot of the houses have bright colored doors and are so snap-worthy, #ThatPinkDoor even has it’s own hashtag. You can just grab free bikes from your hotel and opt for a self-guided tour with most of the famous doors located in South Palm Springs, making it an afternoon well spent. Rent a classic Cadillac: Everyone has a favorite vintage car that brings up memories for them; whether from a movie, their childhood, or simply one that pulls at your heartstrings. Palm Springs is the perfect place to make it happen. It’s just so American to ride in a classic Cadillac, top down and hands in the air. A treat from Ice-cream & Shop(pe) : You simply cannot have a holiday in a place so warm and carefree, without a visit to an ice-creamery. It’s so adorable with neon signs, a gift shop inside and even a DIY sprinkle bar to make your ice-cream your very own. Disclaimer; this might become a daily thing, but when in Palm Springs right?! Stop by Elvis Presley’s house: If you are a fan of the rock king then you will adore to explore his estate that he used as a retreat from his life in LA in the sixties. Elvis and Priscilla had their honeymoon here and it consists of three stories, yet none of the rooms have corners. Every single room is a circle which makes it bizzare yet also intriguing. There are daily guided tours so make sure to book a spot online!